Interesting Google+ blog post from Googler ranting about platforms. Steve Yegge outlines his time at Amazon while they shifted to SOA, Facebook's threat and where he feels Google must go. It's hard to not agree when you see the impressions/traffic and FB Credits revenue Facebook receives from apps others are building on their platform. I was impressed when I learned more than half of products sold on Amazon's platform/marketplace were by 3rd party merchants. Both Amazon and Facebook have the world assisting in their infrastructure, Amazon by selling AWS/services(their dog food) and Facebook by opensourcing. FIO - Fusion-IO posted great results during today's investor earnings call! Growing their $1million+ customers this quarter to 6, but, due to customer privacy not able to discuss the specific growth of Facebook or Apple. During analyst questioning I was happy to hear CEO David Flynn dive into under utilized CPUs and effect on SW licensing. Fusion-IO has the ability to quickly feed data to CPUs keeping them busy, better leveraging software licenses. Anyone that has been through the Oracle or SAP CPU core licensing dance knows were the pain/money is in scaling. 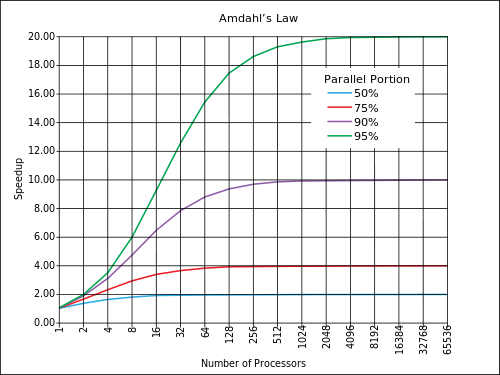 David mentioned Amdahl's Law to describe how throwing just CPUs at scaling has diminishing returns plus per core SW licensing costs.